Welcome To Innovative Education Center Of Earth Sciences! 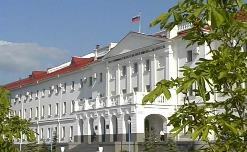 Innovative Education Center Of Earth Sciences was established by Sevastopol Branch Academic Council of Lomonosov Moscow State University (MSU) aimed at coordination and interdisciplinary integration of MSU departments and units in their educational, research and innovative activities focused on solving the current and prospective scientific problems. The activities of the Innovation Center of Earth Sciences are mainly performed by the employees of the MSU Geology Department and the Geography Department of the MSU Sevastopol Branch, who are involved in research work, educational process, and innovative development within the scope of the Center. The partners of the Innovation Center of Earth Sciences are the leading scientific institutes of the Russian Academy of Sciences, universities and enterprises. The 1st International Conference "Unconventional Sources Of Hydrocarbons: Multidisciplinary Researches"
Innovative technologies in geology, geophysics and geography are of great importance due to their close connections with various applied problems and tasks such as search for mineral deposits and their exploration, evaluation of engineering-geological conditions and environments, including forecasting of catastrophic geological processes and phenomena.